25 July 2009 – San Fabian. The chapel of Brgy. Binday was one of the barangay chapels destroyed by Typhoon Cosme last May 2008. This did not deter the residents of Binday to welcome the sacred images of the Divine Mercy and the Blessed Virgin Mary. It was decided among themselves that the home of Mrs. Marissa Gachallan will shelter the images. The Adult Formation Program was held in the same place. The Youth Encounter, however, was held at the Barangay Hall. Mass and the celebration of the sacrament of Baptism were celebrated on 25 July 2009, Saturday. The images were received by Brgy. Ambalangan Dalin from Binday in the afternoon of 25 July, Saturday. To see more pictures of the visitation in Brgy. Binday, please click HERE. 24 July 2009 – San Fabian. After a little more than a month, the project initiated by the Parish Pastoral Council as a commemoration of the hosting of the Vicariate III Celebration of the the Solemnity of Christ this coming 22 November 2009, is about 95% finished. The Pastoral Pastoral Council last 20 May 2009 decided that one of the two major projects that would be built would be the construction of a covered pathway linking the parish church, the parish center and the Mt. Carmel Chapel. The other project is the repair of the roof of the parish rectory. The project was started lat 10 June 2009. Bro. Bernie Solis was tasked to build the covered pathway with Engr. Santiago Alhambra. Polycarbonate material is used to cover the pathway. The project will protect parishioners from rains and will provide shade for parishioners as they walk from the church to the parish center. When finished, the project will cost about Phil Pesos Two Hundred Eighty One Thousand (P281,000.00). Funds for the construction of the pathway are being solicited from the generosity of the parishioners. To see pictures of the project since its start, please click HERE. 18 July 2009 – San Fabian. The heavy rains brought about by Typhoon Isang did not deter the faithful of Palapad from welcoming and showing their love and devotion to Jesus, the Divine Mercy and His mother, the Blessed Virgin Mary. In a solemn mass presided by Rev. Fr. Oliver E. Mendoza, the parish priest, the week long visitation came to an end. The celebration of the Sacrament of Baptism followed with eleven children receiving the sacrament. The visitation in Palapad was from 11-18 July 2009. Due to the inclement weather, the Youth Encounter was postponed and re-scheduled a week later. The adult formation program however pushed through. The faithful braved the rains as they brought the images from the chapel of Palapad while on procession to Brgy. Binday. Procession transferring the images from Palapad to Binday. To see more pictures of the visit, please click HERE. 12 July 2009 – San Fabian. The 38th Parish Renewal Experience weekend seminar was held last 10-12 July 2009 at the Parish Center. Despite the rains and the bad weather, the 38th edition of the Parish Renewal Experience (PREX) was one of the best attended. Fr. Oliver E. Mendoza, the parish priest, with Bro. Estephen Espinoza gave the talks to the participants. PREX Class 37 sponsored the weekend seminar. Bro. Cris Bautista was chosen as the PREX Class Coordinator. The Parish Renewal Experience is an adult formation program which has been with the parish since 2004. Please click HERE to see more pictures of PREX Class 38. 11 July 2009 – San Fabian. Brgy. Mabilao welcomed the images of the Divine Marcy and the Blessed Virgin Mary during the week of 27 June to 4 July 2009. Brgy. Lipit-Tomeeng had their Visitation a week later, from 4 to 11 July 2009. 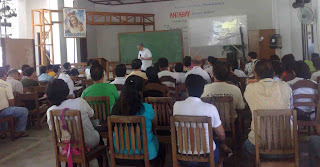 The Visitation was highlighted by the Formation Program involving the adults on topics such as “The Family”, “Basic Doctrines” and “The Bible”. The youth had their formation during these days with the seminar on Youth Encounter. Rev. Fr. Oliver E. Mendoza, the parish priest, celebrated the mass to culminate the visit in Mabilao while Fr. Abraham Esquig, celebrated the culminating mass in Brgy. Lipit-Tomeeng, a week later. Click HERE to see more pictures of the Visit. 28 June 2009. The Archdiocese of Lingayen-Dagupan Social Action Apostolate held a series of formation sessions with the different lay Social Action ministers of the parishes of the archdiocese as part of its continuing formation program. The two-day formation program was dubbed as “ANTABAY: BECOMING NEIGHBOR”. The parish social action core team ministers attended the formation program. The Archdiocesan Secretariat led by Ms. Janice R. Hebron facilitated the different workshops and sharings during the seminar. At the end of the seminar, all the participants were formally commissioned by Msgr. Renato P. Mayugba, DD. ASAP then is a response not only to the directive of the Archbishop as a pastoral response but being faithful to the mission and calling of the Church in her proclamation of the Gospel, and in obedience to the command of Jesus, viz., to love God and to love our neighbor. The ASAP of Lingayen-Dagupan is the actualization of this mission, calling, life and ministry of the Church. ASAP is our ecclesial response to our being sent by Jesus, through the Church, to fulfill the mission of loving our neighbor and loving our God, for one cannot be separated from the other. It is our service as a Church, specifically, the local church of the Archdiocese of Lingayen-Dagupan. It is our service as Christians to the poor and the marginalized in our society, for this kind of service is also directed to the cause of God for His people. 27 June 2009 – San Fabian. The Barangay Evangelization Program was held in Brgy. Tiblong (13-20 June) and in Brgy. Alacan (20-27 June). The adult catechetical formation on Family Life, Basic Doctrines and the Bible was given to the residents of these barangays. The Youth Encounter (YE) was also given to the youth of the barangays. Teams 1 and 3 facilitated the adult catechetical formation. Rev. Fr. Abraham Esquig celebrated the Eucharist at the end of the visitations in these two barangays. Fr. Abraham Esquig was once a pastor of the parish from 1981-1987. He is now a guest priest of the Parish of St. Fabian. He retired from active ministry upon reaching the age of sixty five. Bro. Estephen Espinoza in Alacan.